Great little semi-evergreen clumps for shade - even quite dry! This species is often the first choice for gardeners who are stuck with a dry shady position, perhaps under the rain shadow of a wall or fence. It is an amazing plant that seems able to grow well in very dark positions and tolerates drought better than most others. Geranium nodosum makes tidy clumps of glossy leaves which appear to have only three divisions rather than the normal 5 of all other cranesbills. This is just an illusion as the other two divisions are present, just reduced in size. For many years only two forms were available but during the 1990s and 2000s many more forms were named and to this day there seems to be at least one more each year. Unfortunately their neat clump forming habit means that they increase relatively slowly on the nursery, and due to their high demand we often have very limited stocks. They can, and do, self-seed but when you have as many different forms as we do it is not possible to distribute the seedlings as they are all different to their parents. You may find that in a restricted garden situation with just one variety it appears to come true from seed - they don't when you have lots! 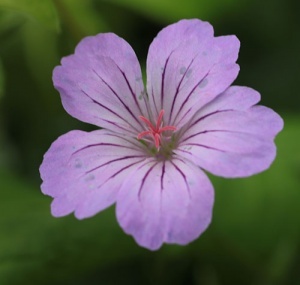 Unnamed seedlings from our range of cultivars of this valuable cranesbill for shade, even quite dry. Likely to be lilac-pink maybe with purple markings. c. 30cm.